The International Space Station moves away from the Space Shuttle Discovery after a 1999 mission. In this historical photo from the U.S. space agency, backdropped against white clouds and blue ocean waters, the International Space Station (ISS) moves away from the Space Shuttle Discovery on June 3, 1999. 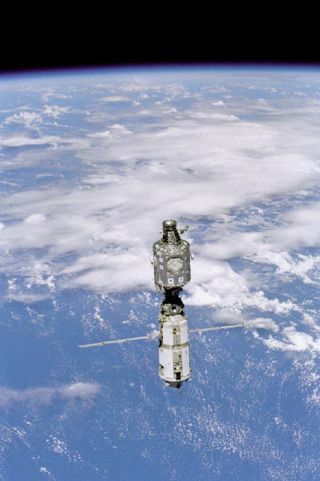 The U.S.- built Unity node (top) and the Russian-built Zarya or FGB module (with the solar array panels deployed) were joined during a December 1998 mission. A portion of the work performed on the May 30 space walk by astronauts Tamara E. Jernigan and Daniel T. Barry is evident at various points on the ISS, including the installation of the Russian-built crane (called Strela).